Like to take photos or videos? Learn how you can honor the 145th anniversary of the Golden Spike—ceremonial joining of the transcontinental railroad, which excluded Chinese Railroad workers. 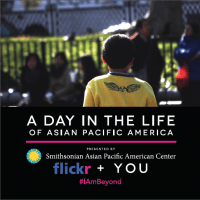 Register for the Smithsonian Asian Pacific American Center “A Day in the Life of Asian Pacific American” to document your May 10th in pictures or video, and be sure to tag your submission from “Boston” to be included in a Boston event this Fall! Also, attend a local Boston workshop to learn more about the legacy of Chinese Railroad workers and exclusion laws, including issues facing current day Asian Americans. And to help prepare for May 10th, you will also hear tips on how to capture impactful images! Funding provided in part by MA Cultural Council, The Boston Foundation, Deloitte and Charles River Neighborhood Foundation.